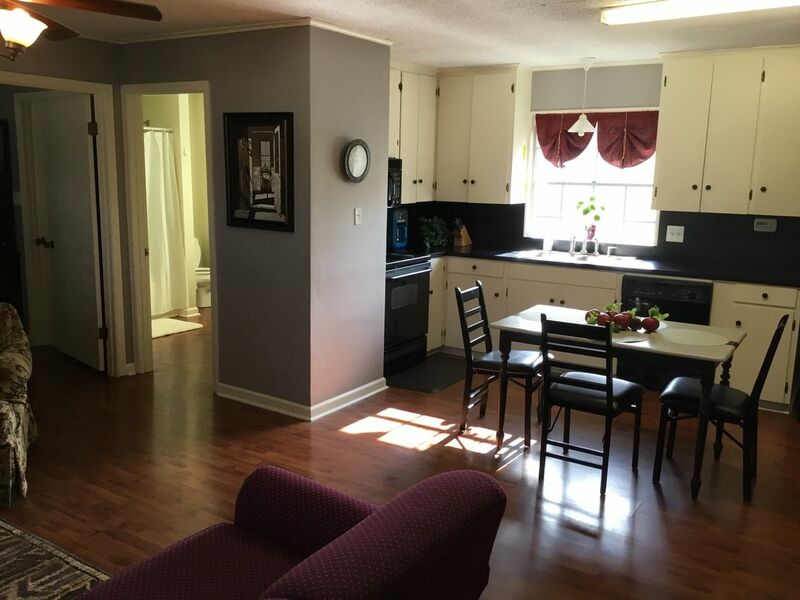 This property is very convenient to both downtown Little Rock and downtown Benton. It is approximately one mile from the Outlets of Little Rock and Bass Pro shop and great restaurants. It is a spacious one bedroom with queen bed and one bath with lots of room outside including front door parking. Laundry washer/dryer, kitchen with refrigerator, electric range, microwave, dishwasher, coffee maker, cooking utensils. WiFi, cable tv, central heat and air, bed and bath linens iron and ironing board are included. Long term rentals are welcome and pets are considered. Our family is one big happy family. We love God and our country. This place is so peaceful. House on acreage surrronded by housing developments. Discount Store is close. Pond on property can be fished. There is an additional area with desk/chair could allow be used as a vanity/dressing area tucked away behind the bath near the laundry. Walk in closet in BR. No pets are allowed. We do have pets on the property. Everything was great. It was very clean and had everything we needed. We spent Thanksgiving week with family and this was the perfect alternative to a hotel room. Very comfortable. Thanks Kathleen, I really appreciate your good review. Pleasure to host you and yours. A home away from home while daughter was in a rugby camp. The place was cute. Location great, We were near the mall, a mom and pop grocery store, a park and the Hwys. We enjoyed the interaction with the owners. My grandson was happy with the yard to run around. Overall , enjoyable and would rebook. Clean,close to freeway, and host was great. This wonderful cottage was exceptional. The hosts could not have been more gracious and were very attentive to ensure that I had everything I needed. For my purposes, the location was ideal; close to the interstate freeway system but far enough away to provide a quiet, countryside setting. Very conveniently located to the Little Rock Outlet malls so that shopping was no problem. Thanks so much Ray.! Glad it was such an easy commute to everything you needed. You are certainly welcome back any time.